DISCOVER AND ENJOY THE POWER OF SMALL TOWN LIVING ! We want to take your visions and enable you to create a foundation for your future with Real Estate and memories to last a lifetime. What makes us different is our ongoing dedication to LISTENING and CARING, communicating with our clients throughout each phase of the transaction and striving to maintain Higher Standards of Excellence in the industry.We have the foresight to be a unique Real Estate firm in a changing economic world. We offer fresh, new simplified professional services on your behalf, something for every budget, extraordinary, first-class, honest, old-fashioned service with state-of-the-art, modern, computerized technology that covers the globe, experience you can trust, confidence you can rely on and we'll "MOVE MOUNTAINS" to bring you home to the good life here in the Heart of Blue Ridge Country. We will provide you with a detailed walk-through evaluation of your home or property, which will enable you to prepare it for sale. Let us show you the way to market your "OLD" House to "SOLD" HOUSE and get a great return on your investment. Check out our Sellers Info Link for detailed i nformation on how we can help you accomplish your goals. At New River Realty®, we make the sale price of your HOME-run! Let New River Realty® show the world what you've got to offer. We would be honored to list your property for sale. Call us today! STUMPED? Let us cut down your legwork! Tired of the ROAM for a NEW HOME? Looking for a little Farm on the Prairie? Well, there's a lot of fun in mountain property and we want you to come play with us here in the Tri-County area. The Virginia Highlands offer endless possibilities for residential homes, recreational homes, commercial property, vacation rentals, retirement property, investment lots, land, farms & acreage, along with enthusiasm for hunting, hiking, trout fishing, canoeing, tubing, camping, horseback riding, vineyards, antiquing, flea markets and tourism. Every season here in the mountains brings its own visual beauty and joy. Let us show you some Virginia mountain property and start living. Join our list and automatically receive personalized HOT New MLS listings by e-mail. We will search the MLS and find the land, homes and farms that match your criteria and notify you immediately with the latest listing information!! Simply choose "MLS SEARCH" and fill in the requested information or search for yourself at "SEARCH LISTINGS". 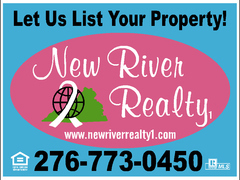 New River Realty®, it's as simple as that! New River Realty®, Brokers and Agents are Proud Members of the Virginia Association of Realtors, the Southwest Virginia Association of Realtors and the Multiple Listing Service (MLS). Our Realtors have the knowledge, take the time, provide the care and search for the value you are looking for. With our assistance, perseverance and guidance your criteria will be found and your expectations will be exceeded. We specialize in representing our clients in the purchase and sales of single-family residences, mountain cabins, farms, recreational property, commercial land and investment income property throughout Southwest Virginia in Grayson, Carroll, Floyd and Wythe counties. This includes, but not limited to, the cities of Galax, Hillsville, Independence, Troutdale, Mouth Of Wilson, Elk Creek, Floyd, Wytheville, Sugar Grove, and Fries. We are Proud Members of the National Association of Realtors, The Virginia Association of Realtors and the Southwest Virginia Association of Realtors & MLS.